Come READ books at the Uni Project’s pop-up reading room. Come EXPLORE nature at a hands-on science exhibit from the Uni Project and HYPOTHEkids. Come DRAW with fellow New Yorkers at an open-air art studio from the Uni Project. Come SOLVE unusual puzzles at a puzzle station from the Uni Project. Download high resolution logo as PNG, GIF, EPS, or SVG. Other logos available here. Open this gallery and click+drag photos to your desktop. Photo credit to “The Uni Project” appreciated but not required. 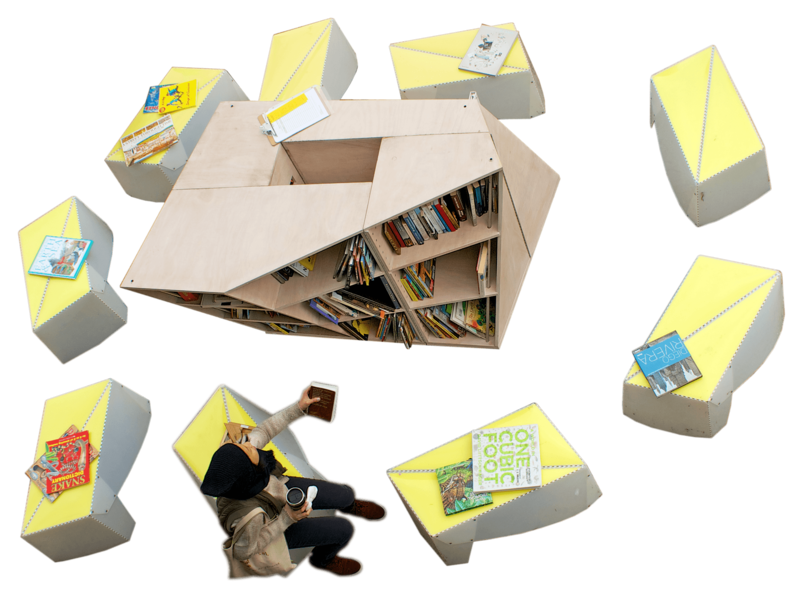 The Uni Project creates learning environments in public space across New York City. Using custom-designed infrastructure, we pop-up in parks, plazas, and other public spaces to offer reading, drawing, and hands-on experiences for all ages. We partner with community organizations and city agencies, and we prioritize underserved locations. We also send kits around the world so that other cities can copy our model. We do this work to improve the urban environment, strengthen New York City neighborhoods, and make education a visible, enjoyable part of urban life. The Uni Project is the work of Street Lab, a 501c3 nonprofit. Read more about the Uni Project. READ NYC is a pop-up, open-air reading room that offers a curated collection of books and a place to read together in public. EXPLORE NYC is a hands-on science exhibit that brings the exploration of nature and science to the streets. DRAW NYC is an open-air art studio that gives people access to fine art materials and a place to draw in public. BUILD NYC is an installation of interactive building stations featuring a range of materials with which to build and design and engineering challenges. SOLVE NYC is a puzzle station, with unique and unusual puzzles of all kinds. We’ve teamed up with NYC Department of Transportation (DOT) so that thousands of New Yorkers can enjoy special programming—pop-up reading rooms, open-air drawing studios, and more—at “Weekend Walks” across New York City. Weekend Walks are events that promote the use of neighborhood streets as public space. Community-based organizations apply to close a street temporarily and then create events that draw people out, highlight local businesses, and encourage neighbors to come together. In 2017, we created a special pop-up reading room for Weekend Walks that included books in multiple languages sourced from museums and independent bookstores in NYC. In 2018, we’ll again offer the reading room in partnership with NYC DOT, as well as new programming options that help community organizations activate public space. Here’s our schedule. Subscribe to our quarterly email newsletter. Read our blog. Visit our event calendar. The Uni Project works in partnership with NYC DOT to provide programming at select Weekend Walk events in NYC. For these deployments, community hosts should expect our program cart(s), tents, benches to be delivered in advance of the event by NYC DOT. Thanks for your help in securing the gear until our arrival, usually 30 minutes prior to event start time, when we will take responsibility for set-up.